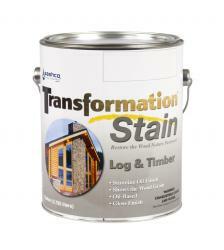 Sashco Transformation Stain is perfect for adding luster to any old, eroded, or dull stain. This stain works even if your old stain is eroded or failing. Sashco Transformation Stain will transform the appearance of your exterior logs and exterior vertical woodwork from dull and lifeless to rich and brilliant.